In defiance of NASA, Jane Holloway, the linguist of the Providence expedition, commandeers the alien ship that crew explored. She sets off to return that ship's marooned navigator to his home world, determined to discover who was behind the genocide that destroyed his original crew. But when she gets there, she finds his world devastated by the same plague. The remaining members of his race, uniquely gifted at navigating the stars, are stranded across the galaxy. And someone, it seems, doesn't want those lost navigators to be found. As Jane unravels the mystery of the plague and works to ensure the survival of Ei'Brai's race, she discovers that the life of every sentient being in the galaxy may be in jeopardy, and the clock is ticking. I enjoyed the two narrators. The story developed more depth in book 2, yet parts of the story tended to lag, particularly when action sequences slow down because of discussions over cultural issues (the timing and placement of these moments slowed things down) - especially the long gender tangent during an important turn of events for another main character! Seriously - the "coming of age" party stalled great plot momentum. Lost some steam at that point and didn't really regain speed. And the ending....not sure what was going on the last hour of the book. Seemed like trying to tackle too much. Could have ended the book sooner and maybe included the last bit in book 3. However, overall enjoyed the continuance of the storyline from Fluency. Exciting series! I hated it. It ended. LOL. Seriously it is a good book and the ending and story sets things up for the possibility of many more sequels. I am looking forward to the next one. The author has a great storyline. Would be nice to see further character development of all the characters. The narrators do a good job and help differentiate between the 2 main characters making it much easier to track. Overall, enjoyable book and looking forward to next book in the series. I haven't had this much fun on a spaceship ship since I boarded the 'Streaker' (Startide Rising.) With an aquatic shipmate, alien politics, alien tech and oh so much action. Jane Holloway leads a team of humans and Ei'Brai back to presumedly return the ship 'Speroancora.' Instead of returning the ship she actually finds new truths, extra crew and a new mission directive. Do yourself a favor and get the book. But please if you haven't already read Fluency go get it so you don't miss a thing! Great continuation of the story, good character development and the love scenes were not overly graphic! Couldn't put it down. A different more personal sci-fi style. looking forward to more. This is a great followup to a great book. I was honestly surprised by how good it is. I expected this book to be a bit cheesy. When humans are depicted as making a rapid jump in technology the result is often less than credible. Not so here. The transition was handled expertly; and, most importantly, the result is believable. The characters are well developed, even more so than the first book. They are people, and aliens, we can care about. The only fault I can find is in the series itself; the books are just too slow in coming. Okay, I know, I'm not the one doing the writing here. Patience, I keep telling myself. And despite the admonition, I wait impatiently for the next book in this great series. The first thing I have to say is, if you haven't read the first book in this series, Fluency, don't read this one until you do. You'll enjoy it a lot more, because much of the brilliance of Fluency is the connections you make between our world and the author's storyworld. Seriously, read Fluency first. Also, if you haven't read Fluency, you should stop reading this review, because there are spoilers in it (spoilers of Fluency, not of Remanence). As for this book, well, you know the concept of a "sophomore slump?" Not here. If anything, this one is more gripping. Which is especially impressive considering this is all world-building; Foehner Wells didn't have the luxury, as she did in Fluency, of drawing on scenes and legends from our world to make connections with conspiracy theories of Area 51 and top-secret NASA programs. She had to create it all and keep it coherent.There's one spot about three-quarters of the way through where things may start seeming to drag a little, culminating in one extremely awkward moment involving Bergen and a very young alien (you'll know it when you see it). If the plot has a flaw it's that -- the awkwardness serves an important narrative purpose, but the temptation to get off the bus and avoid the awkwardness will be strong. Don't do it; the stuff that's dragging is building up to something; and it's right after that scene that things get good. And by "good," I mean really good. This author has a particular knack for platforming plot developments so that you don't see them coming, but when they arrive they seem inevitable and completely free of coincidence or deus ex machina. It's the art of story plotting, and Foehner Wells is really good at it. I realize that sounds vague, but trust me, if I spoiled the last 50 pages of this book for you would want to kill me. The narration is top-shelf. Burney narrated the first book as well (Fluency) and I was really happy to see that she'd narrated this one too. In general I'm not a fan of multiple narrators, but in this case I think adding Linden's voice to the mix makes it better -- he narrates the chapters that are in the points-of-view of the two major male characters, while the majority of the chapters are voiced by Burney, from the POV of the hero (Jane). The book never changes narrators in mid-chapter, even if the POV changes mid-chapter, which in my book is a very good thing; I find audiobooks that trot out a new voice in the middle of a scene very disconcerting. This one never does that. In this book, the multiple narrators add to the depth of the experience rather than distracting from my immersion. TL;DR: Yes. Yes, yes, yes. But not until after you read Fluency. Seriously, read Fluency first. That is all. 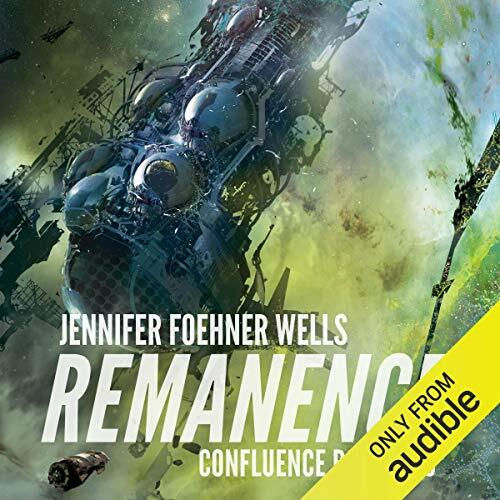 Remanence is book 2 of Jennifer Foehner Wells' Confluence series. Jane has defied NASA and attempted to return the alien spacecraft with the one surviving alien back to its "home" system" only to find that the other alien race that employed the squid-like alien for interstellar travel has been reduced to a pre-industrial state. After some bumbling efforts at diplomacy and cultural appreciation, her crew has become a bit larger and embarks on learning what has become of these former sentient and highly capable beings only to discover the galaxy's menagerie of destructive elements is larger than previously thought. The sci-fi elements focus mainly on alien life forms and their unique cultural peccadilloes. Jane's squid-buddy and his race oscillates between a train pet and a megalomaniac. The humanoid race is rather unremarkable except perhaps for their rabid vegetarianism which is a bit at odds with their past accomplishments. While the plot is compelling, the story drags with too much anthropomorphic qualities among the aliens. At the same time, the number of unconsummated trysts between Allan and Jane swings between a mundane romance novel and a rom-com teleplay. Jane is the magnet and the only driver of action, while everyone else is just along for the ride, both humans and aliens so character motivation is lacking. The choice for two narrators, male and female was a nice touch as the point of view shifts from Jane to Allan to squid. Range of voices and pacing are adequate.